The audio and different video signals are available on the A/V jack of the C64. The output of the audio signal is available on a pin of the jack and can be fed separately to the TV set, Monitor or stereo set. The video signal, that drives a TV set or monitor, can be picked up as "composite video" or Y/C which is similar to "s-video". Apart from that, there is an audio input that is connected to the external audio input of the SID sound chip. The a/v jack is a DIN jack with five or eight pins (both DIN 41524). The first C64 models still had a five pin jack, like in the VIC-20. Shortly after that an eight pin jack was built in, providing the additional chrominance signal. The eight pin jack is not after DIN 45326 (pin arrangement: 270°), like indicated and pictured wrongly often, but after DIN 41524 (pin arrangement: 262°, horseshoe shaped). It's possible to forcibly plug in a wrong plug into the jack, but one should get the right plug in the first place on a new purchase. Should you happen to get the wrong plug and wasn't planning to use the +5V pin then you can remove the upper two pins out for a perfect fit. On the VIC-20 the composite video signal is on pin four like on the C64 or C128. Additionally it is on pin five with a higher voltage level. Therefore a C64 a/v cable that uses only pins 2, 3, 4 (ground, audio, video) can be used unmodified on a VIC-20 or C128. Attention is advised when using a special a/v cable where incompatible signals could collide with each other. Installation instructions for a second SID (stereo SID) often propose to use pin five (audio in) as the output of the right channel.Though this is compatible with the pin assignment of stereo sets that used five pin DIN plugs in former times, it's not advisable. Due to the RCA plugs used nowadays, instead using the not connected pin 7 is an obvious choice. This is a video signal in the format of the analog TV signal before RF modulation. In the C64 it is the standard format for PAL (most of the world) or NTSC (U.S.A./Japan). If a TV set has a composite video input it should be preferred over the RF signal, which loses quality by modulation in the C64 and demodulation in the TV set. Because the signal contains the information of the video brightness and colour it is named composite video signal or CVBS (Colour Video Blanking Signal). The chrominance (colour) is a part of the s-video signal (also Y/C signal). S-video is used in many monitors and should also be preferred if using a TV set providing a corresponding input (seperate or on the SCART jack). This audio input (maximum 3 volts) is connected to the audio input (pin 26) of the SID sound chip. This signal is routed through the SID filters and/or output stage, depending on the programming. It is then put out together with the internally generated voices through the volume regulation of the SID on the audio output. Several Commodore monitors included a cable for connecting to this port. A common configuration in the monitor end of these cables was a set of three RCA male connectors: luma+sync, chroma, and audio. 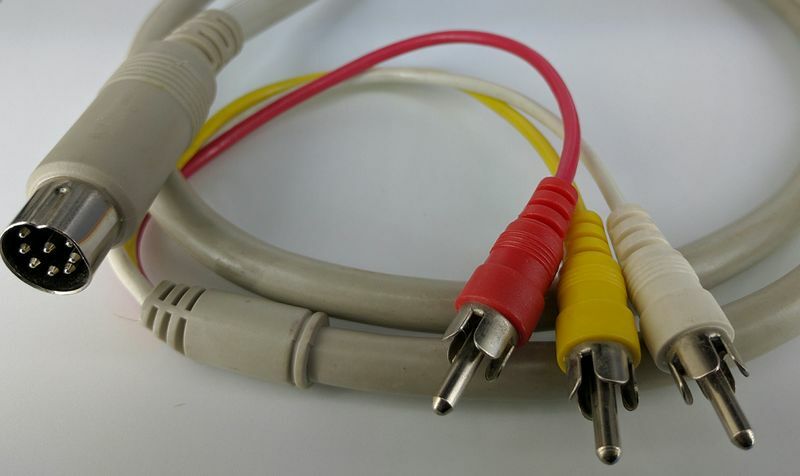 These "LCA" cables usually had colored connectors, yellow for luma+sync, red for chroma, and white or black for audio. Following is the pin assignment of the s-video and the SCART jack. This information should be sufficent to find or build a cable for any device configuration. The C64 outputs chroma at a higher voltage level than the s-video standard, you may need a resistor in series to lower the voltage if you for example experience a checkered pattern on colored areas. Resistance may need to be anywhere from 300 Ohms to 2k Ohms depending on your equipment. * Only on Y/C-video over SCART. Not all devices with SCART connector support Y/C signals! This page was last modified on 28 July 2017, at 01:24. This page has been accessed 55,037 times.